If you think you may be eligible and want to double check, head to www.feesfree.govt.nz and enter your national student number (NSN). If you do not have an NSN number or you don’t know, you can contact NZQA on 0800 697 269. I am an international student can I apply for fees-free? I have a New Zealand Residency Visa, can I apply? Yes, if you have been living in New Zealand for at least three years, while holding your residence visa. Is the programme I am applying for eligible? Note: Students eligible for the Government's fees-free policy will also be eligible for the Mayor Tim Shadbolt Accommodation Bursaries for Invercargill. Please check our website for further information. No, there may still be costs associated with the course. These are items such as print credits, books or equipment that are purchased from sources outside of SIT, optional field trip expenses, costs involved in retaking exams and/or re-enrolment of failed papers, costs associated with applications relating to Recognition of Prior Learning (RPL) etc. For more specific information on the cost of your course please contact our Marketing Team info@sit.ac.nz. 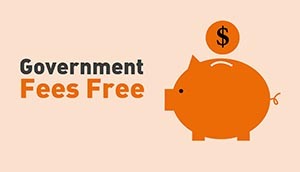 The Government Fees Free policy allocates free fees up to a total amount of $12,000 or less. If your fees are more than this, you will need to pay the difference. What if I have already applied for a course? If you have already applied for a course at Southern Institute of Technology, that is great! We will be in contact with you with regards to your invoice as the amount you need to pay has changed. Please ensure you have checked your NSN number on the government's fees-free website. If I am not eligible for the fees-free policy can I still apply for the Zero Fees Scheme? Yes, you can still apply for the Zero Fees Scheme if you are not eligible for the Government's fees-free policy. To be eligible for the Zero Fees Scheme you need to be either a New Zealand citizen or New Zealand permanent resident, resident, or an Australian citizen residing in New Zealand. Can I still get the Youth Guarantee Scheme? What's the Difference Between Fees Free and Zero Fees?